Wild Turkey has a great distillery experience that is also one of the newest. Visitors will get a chance to go "Behind the Barrel" like I did as their guest, but in a much abbreviated fashion. However, for bourbon fans this is a great opportunity to learn, taste, smell, and see one of the greatest bourbons in the country right now. Last week I had the privilege of joining Wild Turkey for a "Behind the Barrel" experience touring not just their distillery, but some of their partners including Vendome Copper & Brass Works and Independent Stave Company. During this tour, my eyes were opened wide to how complex the science and art of making great whiskey can be. While I knew that the mash bill and number of years aging in the barrel had a big say in how whiskey tastes, there's a whole lot more than that! With Father's Day here - but really any time of year - it's important to think about some cool ideas to do together as a father and son. While some of these ideas are better for dads to take their kids, and some are better for adult relationships - one thing is constant. That universal constant is that these are trips that will provide an opportunity for a father and son to bond outside of the normal day-to-day experience. Conversations will happen, skills will be learned, hugs will be had and at the end of the experience both parties will have had an incredible experience that only the two of them share. So - are you ready to check out some super cool Father and Son guys trip ideas? Mint Julep Cocktail Recipes to Celebrate The Kentucky Derby! With the Kentucky Derby almost upon us, it's time to break out our julep cups, crush some ice and mix up some awesome cocktails so we forget how silly those women look wearing their derby hats! The Bourbon Festival is held each year in Bardstown, KY and if you are looking for the ultimate mancation this destination comes pretty darn close. While flying to Louisville isn't quite as convenient as flights to New York or LA, Bardstown is located right in the heard of central Kentucky and is very close to some of the greatest distilleries in the world, including Maker's Mark and Jim Beam, and only an hour or so drive to all of the names you are familiar with. When you combine that close proximity of the Bourbon Trail with the activities of the Bourbon Festival itself and of course, the Southern Hospitality it makes for a great place to visit. This year we attended as guests of Beam Global Spirits to learn about bourbon, taste bourbon and to celebrate this magical drink that unfortunately too few people really understand - including myself prior to the trip. Looking for a great excuse to visit Central Kentucky? Love to drink Bourbon? 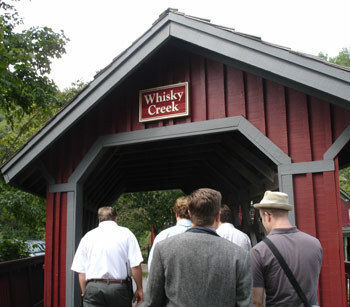 Maybe you should check out the Maker's Mark distillery, located in Loretto, KY! 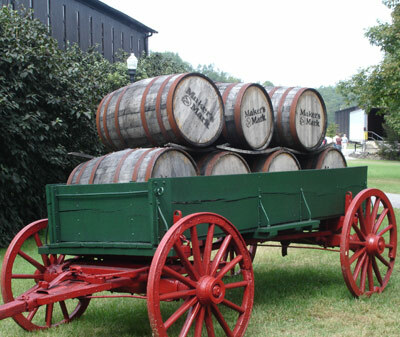 Even if you aren't a bourbon or even a whiskey fan, visiting Maker's Mark is a great historical tour back in time to experience how bourbon was made back in the good ol' days. This is because in addition to distilling some of the greatest bourbon in the world, the Samuels family has made a point to also focus on historical preservation to avoid turning the brand into an industrialized product.